Former NBA star Dennis Johnson died Thursday, the Travis County Medical Examiner's Office said. He was 52. Johnson, who was part of three NBA champions with the Boston Celtics and Seattle SuperSonics, had been coaching the Austin Toros of the NBA Developmental League. "He is deceased and is in our building," said Mayra Freeman, a spokeswoman for the Travis County Medical Examiner's Office. Johnson was born Sept. 18, 1954, in Compton, Calif. He played his college ball at Pepperdine and was drafted by Seattle in 1976. Johnson was traded to Phoenix in 1980 and Boston in 1983. 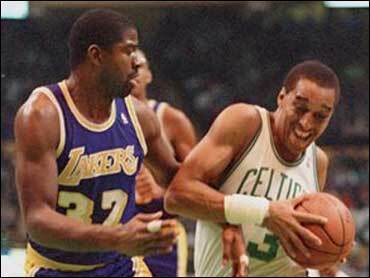 He was part of three NBA championship teams and was named MVP of the Finals in 1979 while with Seattle. He also won titles with Boston in 1984 and 1986. Johnson played 14 seasons, retiring after 1989-90. He averaged 14.1 points and 5.0 assists per game in his career. When he retired, he was the 11th player in NBA history to amass 15,000 points and 5,000 assists. Johnson was a five-time NBA All Star. Johnson, who tended to play well in important games, earned a reputation as a competitive player. "I'm a winner," he once said. "I put my heart into the game. I hate to lose. I accept it when it comes, but I still hate it. That's the way I am." Johnson finished off one of the more famous plays in NBA playoff history. In Game 5 of the 1987 Eastern Conference finals against Detroit, Larry Bird stole an inbound pass and hit a streaking Johnson for the winning layup. The Celtics went on to win the series.